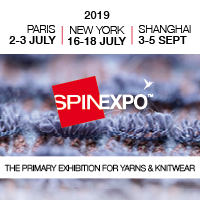 Filo used to be known as the weaving yarn show, but because buying patterns and lead times have altered so much over the past years, there is at least as much interest in knitting yarns of all types, and many mills cater for all sectors. There was an increase in exhibitors, all of them at the high middle to top end of the trade, dealing with top weavers, some who make fabrics and knitwear for couture and iconic brand names like Chanel, it is whispered. Spinners and knitters from Italy, France, Germany, Turkey, Switzerland, Greece, Portugal and Slovenia exhibited yarns and ideas for 2019/2020 and visitors from various knitters and weavers came to the Centro Stelline in the heart of Milan. Filo is not a big exhibition, but it has early ideas and is specialised in high quality fancies and eco yarns, with a strong design content. It is important enough for discerning designers who are seen around the booths and gives an important steer to people catching a first glimpse of the new season. This was indeed the first look at fashion for 2019/20, the end of the second decade of the millennium, and designers appeared to be putting a determinedly cheerful face on the prospect of the third. There were bright colours interspersed with the darker greys and blacks which have come to be the vernacular of city wear, many of these were marled and flecked with a salt and pepper look. Colourful accents gave a new look to these dark tones in fabrics which were knitted up or woven into samples from the yarns on show, e.g. Somelos Portugal with bright yellow and grey 70cotton/wool in yarns for circular and flatbed knitting. Most designs were intended for menswear and womenswear; colourings and palettes are no longer gender specific, at least this year, and are converging. Very fancy looks led the field, with some yarns, as at Avia of Biella, with a wool core and nylon lurex and metallic wrap arounds. Paper fashion, jewels and shine also added to the decorative theme, and there was a substantial move to offer mixtures of three, four or even five different fibres, in a form of alchemy. Techniques and finishes were signalled wherever possible. Stock service offers are now very extensive, the mills have upped the ante, and some can offer hundreds of shades in stock service for delivery at short notice – 300 shades are in stock at Zegna Baruffa. Green initiatives were often mentioned, wellbeing and sustainability were buzz words, alternating with eco, responsibility and traceability, many meaning the same thing. Knitting yarns principally featured cotton and linen as well as Tencel, ring spun yarns for flat and circular knitting, single 2 ply and multiply yarns, core spun with slub effects, using extra-long staple. For example, Supima cotton and Lenzing cellulosic micromodal, Tencel and microTencel were offered at Varvaressos European Spinning Mills, Greece. Olympias’ carded fancy and twisted yarns for knitwear came in Supergeelong wool, pure or blended with other natural fibres, in yarns from thick roving to fine counts and including tweed and bouclé effects for winter fabric collections. Colours included reds, purple, a rose gold, and a vivid grass green, bright enough to look new after the turquoise or lighter green bases in previous seasons. Blue made for a dramatic effect for Zegna Baruffa’s display in the trend area, with various Merino yarns and knitted fabrics in the startling blue. Zegna Baruffa is known for its famous brand, Cashwool, a soft pure wool quality, and included blends of wool with other noble fibres in the new season’s collection. The three brands; Baruffa famed for its upmarket knitwear, and Chiavazza for worsted, or combed yarns with Cashwool quality for fancy and high performance aimed at wovens. The third, Botto Poala collection has an extensive range of exclusive yarn in fine counts. A wide variety of fibres was offered. Pozzi Electa who cover all bases, showed an extensive and interesting range of ingredients and fibres; cotton, viscose; the linen, bamboo, ramie and hemp family, as well as Micromodal, Tencel, Cupro, and Crabyon- the hypoallergenic yarn derived from discarded crab shells, alongside Trevira CS and Kevlar. Others used Lenzing’s SeaCell. Animal fibre was high on the agenda. Makoyak is a novel combination of Mako cotton and yak wool by Pozzi Electa, in 85/15 per cent. Suggestions for the season included alpaca, Yak, camelhair, angora, mohair nearly always blended with Merino wool or cotton. Helpful samples of soft fur and fleece was provided to feel by the Fondazione Biella Master delle Fibre Nobili, the noble fibres society for the advancement of textile knowledge. Camenzind of Switzerland, specialising in spun mulberry silk, had developed interesting blends; silk/wool, silk/baby camel, silk/alpaca royal, and with cashmere, bamboo, SeaCell, Micromodal; also silk/wool and Seacell, and silk with kid mohair. Green credentials were mentioned whenever they could be, and recycled and repurposed fibre are gathering impetus, for example Marchi & Fildi’s Ecotec.